When Do You Like to Splurge? We can’t be good all the time. Sometimes, it makes sense to splurge a little. While you don’t want to splurge constantly, it can be beneficial to you to splurge every now and then. There are many different ways to look at a splurge. In general, though, a splurge is something somewhat unexpected that you are willing to pay extra for. A splurge is something that you choose to upgrade. Whether you decide to fly first class this time, or whether you decide to buy a loved book, rather than check it out of the library. Most of the time, splurges are completely unnecessary. They aren’t things that you require for survival. They are usually unneeded — but fun. For some, it becomes tedious to constantly be pinching pennies. At times, a break from frugality is just what is needed to stay on track. Set aside some fun money regularly. This is money that can be used on something spontaneous. While you might be planning to make sure that the money is available to you, you can use it on any expense you want — including (and perhaps especially) on something frivolous. Even if you use a zero-based budget you can take a break from the planning for a splurge. Simply label one of your categories “splurge” and then spend the money on something surprising. It doesn’t have to be a large splurge, either. Even splurging on something small and simple like a $5 latte, or a $30 manicure can be refreshing. These occasional splurges can keep you from becoming discouraged with frugality. A splurge every now and then, reminding you that you can be spontaneous with your money, can be just what is needed to keep you on track the rest of the time. While your splurge doesn’t have to be on something you need, it should be on something you enjoy. Think about what you like to do, but that you don’t get to do very often. That might be just the thing to splurge on. A splurge should be something out of the ordinary, that you wouldn’t normally spend money on. Whether it’s dessert at a restaurant, or a new book, pick something that enhances your quality of life, while being fun. 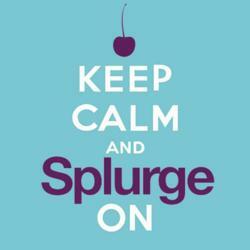 As long as you can afford the splurge, there’s nothing wrong with enjoying it. In fact, I think you should do your best to enjoy some of your money. I like to splurge on experiences. When I’m traveling, I’ll spend extra to stay at a nice hotel. I like to buy small souvenirs (usually fridge magnets), so it doesn’t bother me that they’re over-priced. I also enjoy splurging a little when I find something I think my husband will enjoy. It’s fun to see the look on his face when he opens the present. These experiences stick with me, and serve as reminders of what’s most important to me. While it can be fun to splurge, remember that you don’t want to go in debt over it. Your splurges should git within your spending plan. You should have the money for a splurge before you go out and spend. And if you know you are going to go big on something (like a vacation), make sure that you save up for it. It might seem counter-intuitive to save up for something that’s supposed to be spontaneous, but it’s vital that you be able to afford your splurges without going into debt. That way, you can avoid the interest that can lead to taking years to pay off your debt. As you enjoy your splurges, it’s important to make sure that your splurges stay just that — occasional fun purchases. When you splurge, what are you most likely to splurge on? Vacation is one of my weakness as well. However, I try to find deals where possible and often don’t really care for expensive hotels but spend freely on activities and sights. Splurging is a necessity, it is just like dieting, if you keep denying those cravings it could have the potential to blow up. I also agree splurging must stay in the confines of your budget and you should not buy things that you cannot pay for in the long run. I personally like to splurge on food by going to a nice restaurant on my birthday or a family member’s birthday. It creates lasting memories with the ones whom are closest with you. When I first set out to follow a budget, my goals were set way too high. I wanted to pay off my enormous debt as quickly as possibly. My expectations were so high that after a few months of living frugally (very frugally mind you), and not doing anything socially, I would crack and go out and blow a whole bunch of money on a weekend of fun, which of course put me further into debt. Now I budget in some ‘mad money’ (the misc column of my budget), so I can responsibly use the splurge as a release (I feel kinda dirty just writing that) instead of overspending out of sheer frustration. I’m proud to say that by budgeting in this splurge money I was able to successfully pay off my debt in just one year! I will splurge when I feel like the opportunity will not come around again soon. I’m not talking about retail “sales” that usually wind up at the same price again in a few weeks, but opportunities that are genuinely limited. Usually, this will mean experiences associated with travel, although not always. For example, many people will only be in a particular exotic location like Hawaii once or twice in their life. Once you are there, it seems reasonable to splurge on staying somewhere nice, seeing something interesting, eating somewhere different, etc. Otherwise, I find that I regret not doing that later. This is different than not purchasing a tech gadget or new clothes at the mall. Because I know I can always easily purchase those things later if I really wanted, it does not cause regret.